Mortuary men literally carried this dead man out of the coffin and start walking away with him. Supposedly the man’s family stilled owed GH¢40 balance for the preparation of his body but they sneakily took the corpse out of the mortuary and went straight to bury him. Dead man was pulled out of coffin and taken away. See video below! Luckily some of the invitees joined hands and money together to save the situation and the funeral eventually went ahead. Phew! 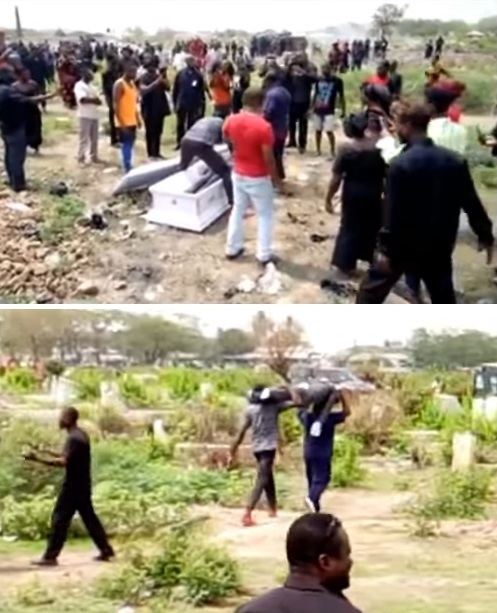 UK Nigerian, Worldwide In Ghana: Dead man's body is seized from coffin but eventually returned Bookmark the permalink.